Looking for a new job? Not enjoying your current role? Out of work and want to make sure that your next step is the right one? Well, this book is about to change the way you see the world of work forever. Why Should I Work for You? 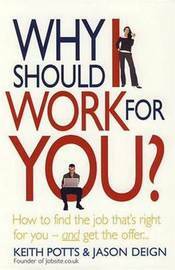 reveals how you can find the job that's right for you, whatever your circumstances. It explores the negative impact that being in the wrong job can have on your health and home life - and how to put it right. Packed with tips, exercises and case studies, it puts you firmly in the driving seat of creating a 'you-shaped job' and sets the course for a better life. DISCOVER: - Proactive advice on going after the right jobs and marketing yourself in the best way. - The key to securing interviews and being able to answer every question thrown at you. - A ten-minute test to help you work out what you need in a job to make you happier and more fulfilled. - Tips on making your current job work better for you, including getting more money from your employer even without a pay rise. - Advice on getting the best possible deal from a new employer. - A unique idea on reviewing your career to ensure it's always working for you. Contents: 1. The right job for you; 2. Happy@work? ; 3. A small step for you, a giant leap for your career; 4. Seizing control; 5. The corporate view; 6. Writing your own job description; 7. Snaring your dream job; 8. The questions you should ask; 9. Big issues with the small print; 10. The annual review; 11. The you-shaped career; 12. Know thyself. KEITH POTTS has been at the forefront of recruitment for almost 15 years as the founder and MD of Jobsite.co.uk - one of the UK's leading online recruiters. With thousands of new jobs added to Jobsite every day, alongside CV, interview and job hunting advice and tools, Keith is an expert on helping people find the right job for them. JASON DEIGN is a journalist and leading business writer. He has worked with many of the world's top employers, including a number of the organisations mentioned in this book.